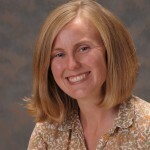 Written by L. Sosnoskie and D. Granatstein, WSU Extension. 2018. 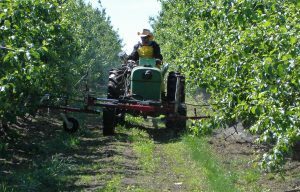 Organic Tree Fruit producers generally use cultivation to manage weeds. However, weed suppressive mulches, mowing and flaming are also employed. These non-chemical techniques should be considered in rotation with chemicals in conventional programs to limit resistance and selection for specific weed classes. Cultivation is standard in many organic orchards. Timing is key. Cultivation is most effective on small weeds. For effective control expert growers tell us they cultivate every 3 weeks. An expert operator is also key who can balance speed with not damaging trees. Several cultivators are available, with different strengths and weaknesses. For example, some are less disruptive to soil and shallow roots, others are better for uprooting well-established grassy weeds, and certain designs are simpler with few moving parts or hydraulics. New equipment is becoming available. For example, there is a new tractor-mounted string weeder for use in the tree row. Caution must be taken to ensure that mechanical equipment does not come into contact with and cause damage to irrigation equipment. 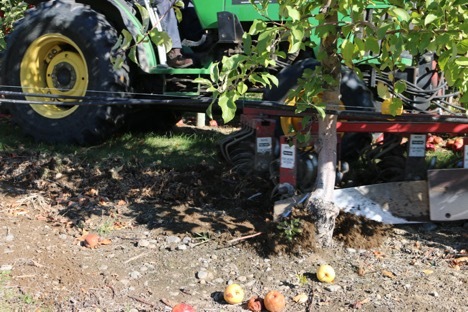 Always follow equipment guidelines on soil depth and spacing from the tree to protect both tree roots and stem bark. Here are some examples as described by growers. Doesn’t go in and out around trees. Have to go fast to be effective, potentially damaging to trees. Goes in and out between trees. Works at various tree spacings. Can get things really clean for fall weed control. Not as fast as some. More moving parts to break. Problematic in rocky soils when dislodged rocks in the grass strips eat teeth/mowers. You have to get off and clean the tines occasionally if you have big weeds. Has guard allowing it to get close to truck without damaging it. Oscillates in and out of tree row. Wonder Weeder with blade cultivating into the tree row. 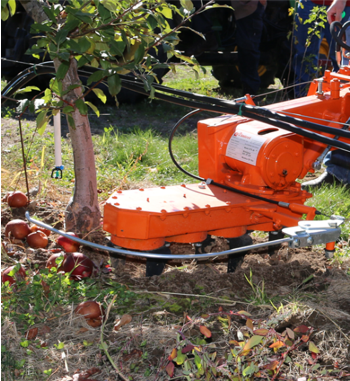 A disadvantage of cultivation is that physical disturbance can also dry and degrade the soil and damage the fine feeder roots of apples near the soil surface. Conversely, mechanical disturbance can reduce vole and rodent problems. Don’t get behind. Have enough people and equipment for frequent cultivation. Hanging sprinkers. Some growers have moved to a 6 ft height so pickers can walk underneath. Permanent sprinklers under the tree are okay if the pipes are rigid. Mowing is an inexpensive practice that will suppress but not eliminate many weeds. It can be used to reduce competition with the trees and to prevent weeds from making viable seed. 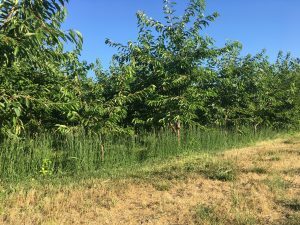 This may be a sufficient weed control practice on mature orchards with satisfactory vigor but will generally not be a good choice on orchards less than 4-6 years old. 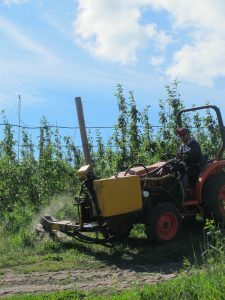 Mowing heads that retract in and out of the tree row and that roll around the trunks are available for good in-row weed control. Mowing will select for low-growing perennial species over time which may or may not be acceptable. Excellent weed control is possible with mechanical tillage as illustrated in this photo several days after the tillage event. Credit: D. Granatstein. 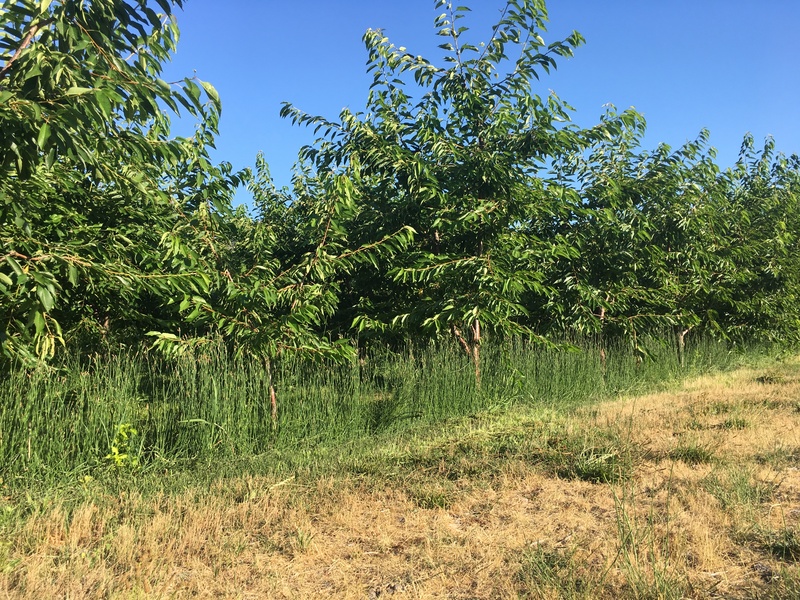 Equisetum in a cherry orchard. Mulches can be used for weed suppression, sometimes in combination with other barrier materials. Organic mulches, such as hay, straw, grass clippings and wood chips, can provide multiple benefits, such as short term weed control (1-3 years), improved soil quality, water conservation, increased tree growth and fruit yield, and/or suppression of parasitic nematodes. The effective use of mulches in an orchard setting can be difficult to implement. Side discharge mowers can blow grass from the alleyway to the tree row but may not deliver enough material for weed control. Wood chip mulch can effectively suppress weeds but requires a large volume of material that can be costly to spread, even if the wood chips are locally available for little or no cost. Not unlike cover crops, mulches may also affect nutrient management and rodent activity. A mulch is best used in combination with other weed control practices, allowing for the soil and tree benefits from the mulch while not relying exclusively on the mulch for weed control. Reports from multiple locations, including Washington State, suggest that wood chip mulch has a lower risk for voles than most other mulch materials. Various materials are available for use as weed fabrics in the tree row; weed control is achieved by depriving emerging plants of light that is required for photosynthesis. Other requirements for tree growth should not be impacted as the fabrics are designed to allow water and soluble nutrients pass through them. 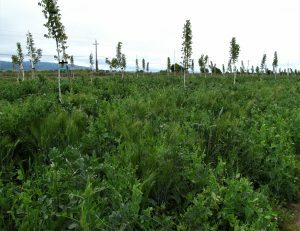 Some weed fabrics may also influence tree performance by changing the temperature dynamics in the soil and under the tree. Most of the commercially available barriers are black, but some products may black on the bottom and white on top, and thus serves the dual purpose of controlling weeds and increasing light in the lower tree canopy. Although the initial investment may be costly, many materials are made to last as long at 10-15 years. A common grower practice is to use a strip of weed fabric on each side of the tree (the width of half of the “weed strip”) and pin it together between the trunks. 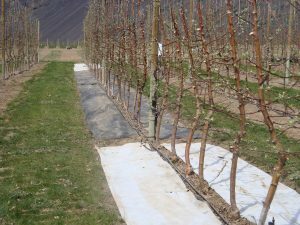 Some growers will open the fabric over winter to disrupt rodent habitat (this is a drawback of the fabric) and to apply soil amendments to the tree row then. The fabric is then closed the next spring when weeds begin to emerge. Fabrics are known to be excellent habitat for voles and increase the risk of tree damage. A trial comparing a typical black weed fabric with a black-on-bottom-white-on-top fabric. Credit: D. Granatstein. 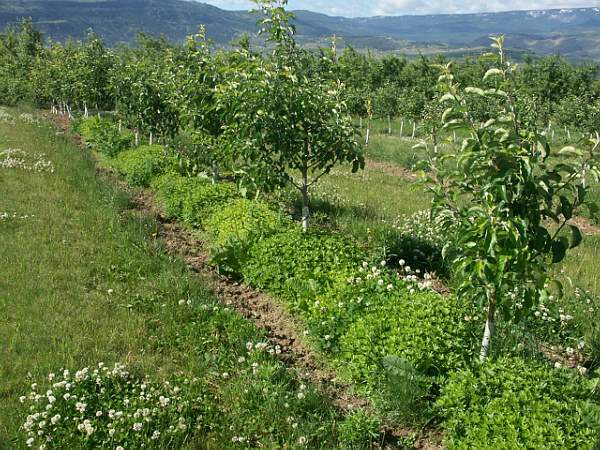 Cover crops can benefit orchards systems in multiple ways such as: increasing the organic matter in the soil, improving tilth and water infiltration and storage, and stimulating soil microbial activity. 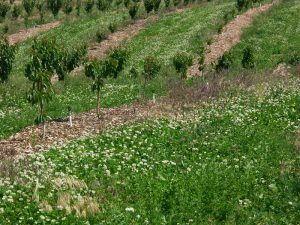 The presence of a cover crop can also minimize the potential for soil erosion, especially in orchards that have been planted on hilly terrain. With respect to weed control, cover crops can physically suppress some species, and in other cases increase weed pressure. 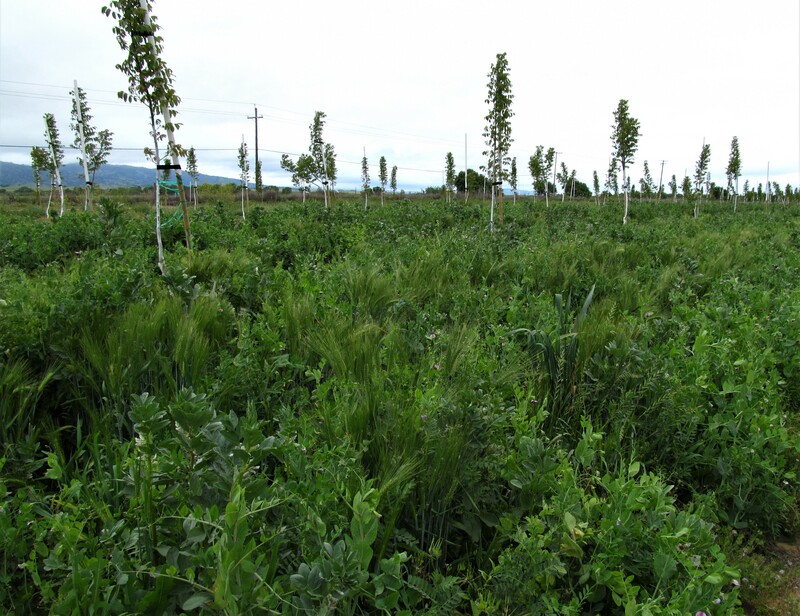 The presence of cover crops may require more water and nutrition than a bare strip to ensure that the trees do not suffer from interspecific competition. 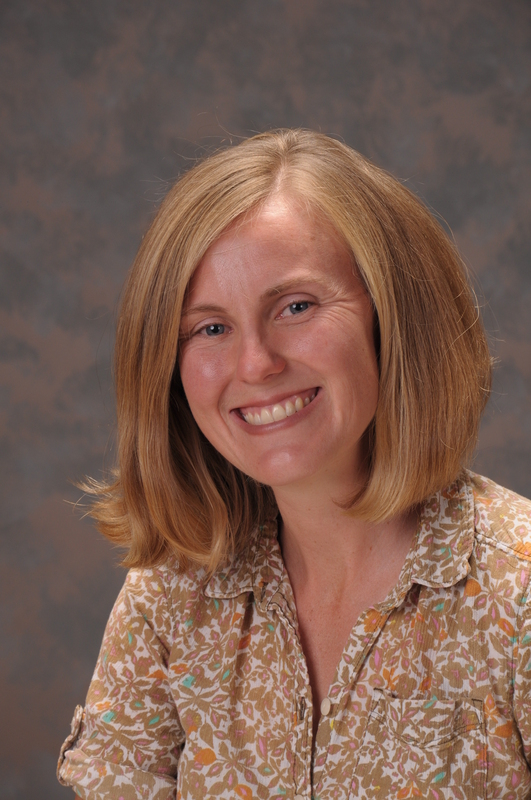 Cover crops may also increase the risk of rodent damage by providing habitat. 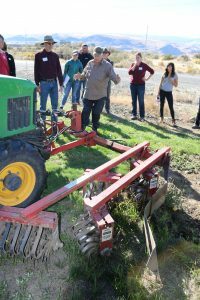 Leguminous cover crops could produce excess nitrogen, which could affect apple quality or leach into the environment. 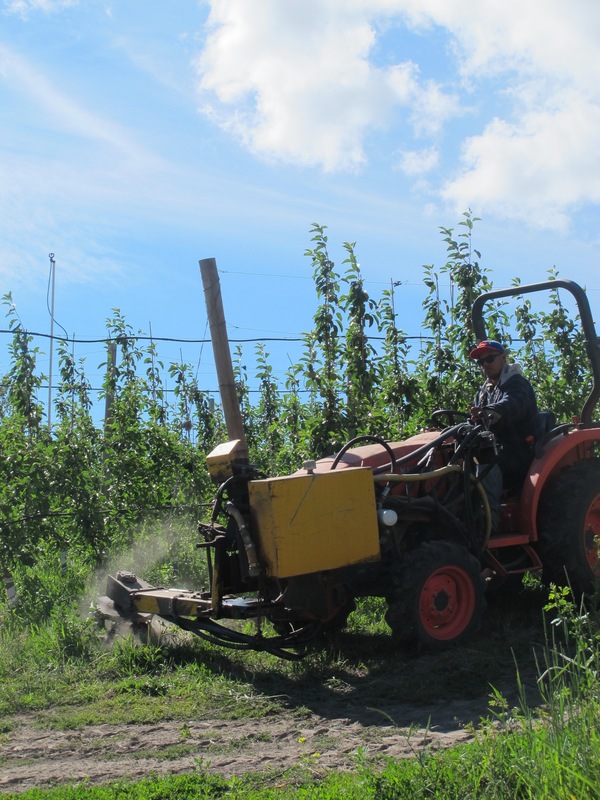 Cover crops can also be mowed, and the residue then blown or raked into the tree row as mulch. A cover crop can be planting in the tree row and/or the drive alley. Perennial grass cover crops in the drive alley are standard practice. When planted in the tree row, a cover crop might be considered a “living mulch” grown to suppress weeds. However, the competition from the cover crop can be substantial and is difficult to manage. While white clover has performed well in some instances, it is also a preferred food source for voles and dramatically increases the risk of tree damage. Example of “living mulch” cover crop planted in tree row, using sweet woodruff (Galium odoratum). Credit: D. Granatstein. 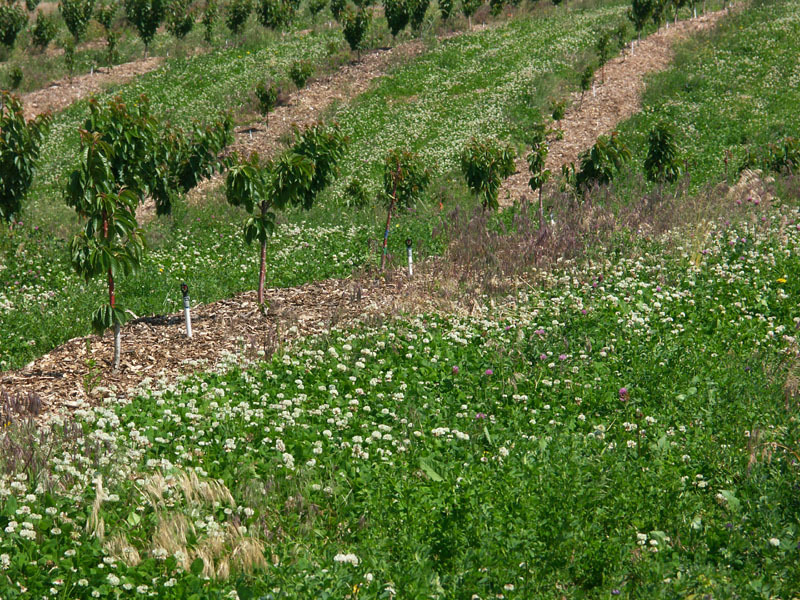 Cover crops in a walnut orchard in California. Flame weeding can be an effective tool at managing small, annual forb weeds. Flaming injures the target plants by disrupting the protective leaf surface, causing them to wilt and die. Because flaming does not kill the crown or root system, some weeds, such as grasses and perennials, are likely to be suppressed, but not killed. For difficult to control species, the flaming treatment needs to be repeated throughout the growing season to deplete the plant’s food reserves. Most flame weeders are mounted to tractors or pulled by an ATV. Propane burners are aimed at the surface of weeds in the tree row, while the tractor or ATV drives along. Shields on the burners prevent heat from damaging the tree trunks, although heat damage can occur if the burners are too close to trees, for too long. Plastic irrigation tubing may also be susceptible to damage by flame. Flame weeders should only be used on living plant material; fire dangers increase when conditions are too dry or too windy. There are other thermal weeders available that do not have open flame, but they are more expensive to operate. 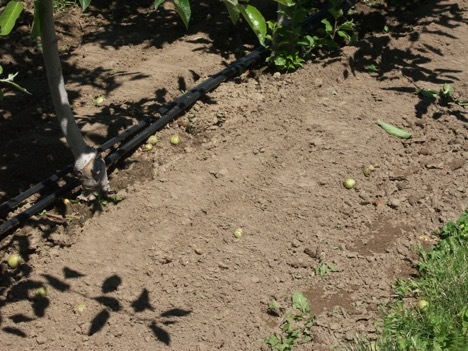 The orchard floor can be wet prior to flame weeding in order to reduce fire risk. Flame weeding in an organic apple orchard. Credit: D. Granatstein. 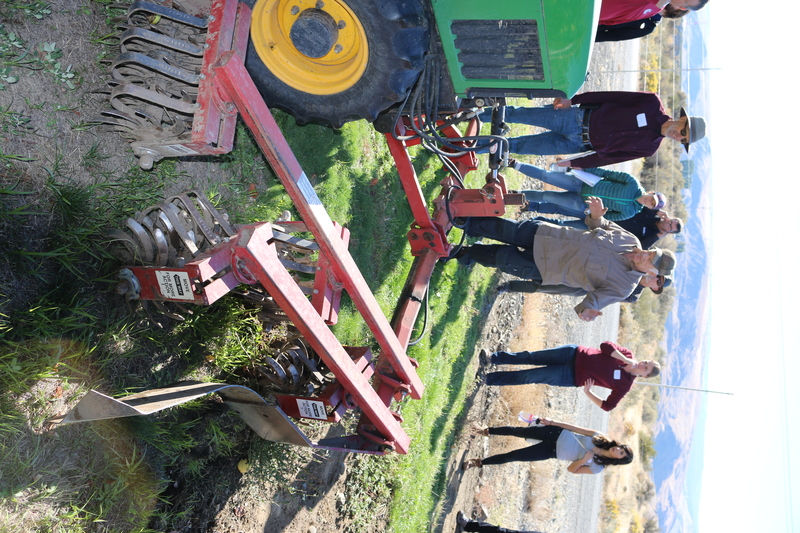 Weed Control in Orchards, D. Granatstein, video presentation, 70th Annual Lake Chelan Horticultural Day, 2015. Orchard floor Management. From WSU Organic Agriculture. D. Granatstein. 2017.